Monday’s Worldwide Developers Conference keynote was an exciting one for me on multiple levels, but the icing on the cake was seeing Apple’s plan for handling images and video on iOS. Come the fall, the company’s 1000-photo iCloud sync limit is history, to be replaced by an all-encompassing, some-storage-required iCloud Photo Library. It’s a pretty big shift for both the company and its users, so before anyone panics, let’s look at what’s going to change with iOS 8 and what’s staying the same. Currently, Apple only lets its users upload 1000 images to Photo Stream; after that, it overwrites the oldest files, providing you with a rotating album of your last thousand photos. You can upload from your iPhone, iPad, or Mac, of course—and even download that content to your computer—but you can never have more than 1000 pictures uploaded. On the plus side, Apple doesn’t charge for this feature, so you don’t have to pay the storage costs of hosting those pictures; on the flip side, there’s no way to pay up to increase the amount stored in the cloud. Apple’s current storage system also happens to be messy. There’s the on-phone storage, synced with your iPhoto library; there’s your Camera Roll; and there’s the Photo Stream. You can delete photos from the latter two, but not from synced storage. In iOS 8, all this is set to change. In the fall, you’ll have two choices: Keep your photos on the phone locally and use Photo Stream to wirelessly sync them to your other iCloud-enabled devices, as you have in the past; or use Apple’s new iCloud Photo Library. Enable the library, and any photo or video you shoot or import will automatically upload to iCloud, where that content is stored at its full resolution and in its original format (JPG, PNG, Raw, you name it). All of those images will be viewable on any iOS device or on the Web; starting in early 2015, you’ll be able to upload and view photos from your Mac, too. Unlike Photo Stream, you’ll have to pay for the storage you use, but it’s going to be dirt-cheap: You get 5GB for free as part of your iCloud account, and you’ll be able to buy 20GB of storage space for just $1/month—or 200GB for $4/month. It’s not yet clear from Apple’s website whether your device’s Camera Roll album will get folded into the Photos app and iCloud, but I’m hoping it will be—if so, you’ll no longer have to delete an image in multiple places to remove it from your cloud-based library. Why is this great? For one thing, having your library synced and backed up to iCloud is a great way to keep your pictures secure and easily accessible; in addition, you should be able to save a good chunk of storage space by only downloading the photos that you need, rather than clogging up your device with every image you’ve ever taken. Having all those images at hand might make you nervous about ever finding anything again. Apple has anticipated your concern, though, by adding both a smart search feature and a Favorites section. The search field will initially prompt you with a collection of nearby photos, images taken at the same time last year (for nostalgia factor), and all-time favorites; but you can also search by date or time, location, or album name. Favorites comes into play with your iCloud Photo Library: Under every picture is a small heart outline; tap the heart to fill it and add the image to your Favorites album. You’ll be able to access that album on any iOS 8 device (or, in 2015, on your Mac), and make edits to images that automatically sync. Apple’s automatic smart albums continue to provide some use here, as well: The Camera Roll looks to have disappeared, replaced by the Recently Added smart album, which presumably collects images you’ve recently taken or added to your device. It joins app-specific and content-specific albums on the Albums page, along with the aforementioned Favorites album. Sadly, based on Apple’s previews, there doesn’t look to be any way to create smart albums yourself, and there’s no indication that a “Screenshots” smart album is in the works. In iOS 7, the Photos app offers a few basic editing features and filters, but for anything fancy, you need to download Apple’s iPhoto app. In iOS 8, bits from iPhoto will make their way into the Photos app, offering you all sorts of advanced editing features. Download an image to your device, and you’ll be able to use a bevy of iPhoto-inspired features to crop, straighten, remove red eye, adjust lighting and contrast, and more. All of those edits sync across your devices, so that the fixed image appears in your library immediately. They’ll also be non-destructive: if you decide you preferred your image unfiltered, you’ll be able to revert it. On top of that, iOS’s new Actions options for developers means that your favorite third-party apps could provide filters and adjustments that you could use from within the Photos app just by tapping the Share button. Love filters from the Waterlogue or VSCO Cam apps? You may soon be able to use them without ever opening those programs on your device. While Apple didn’t talk about iOS 8’s Camera app much on stage during Monday’s keynote, there were a few highlights here and there, and on Apple’s website later in the day. Time-lapse video: iOS 7’s Camera app introduced the modal carousel, which offered users different options for shooting video, photos, slow-motion video, square images, and panoramas. iOS 8 looks to add a new mode: Time-lapse video. Just point your device and press record; the app will snap photos at dynamic intervals to create a timelapse video—no manual speed modulation or editing required. 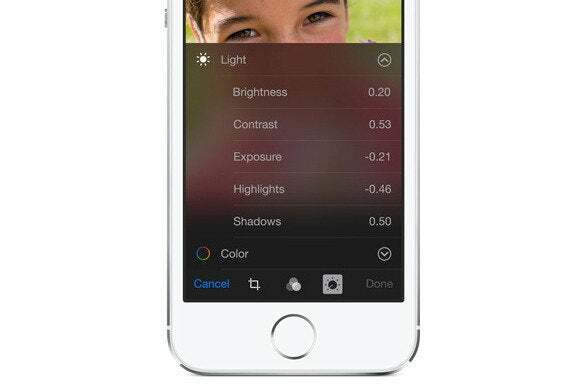 Manual focus and exposure controls: Not only will developers have access to manual camera settings such as focus and exposure points for their third-party apps and extensions, but you’ll also soon be able to independently control the focus and exposure of a scene in iOS 8. There are several ways the Camera app could implement this, including tap-to-focus with an exposure slider or two separate tap-to-focus reticles. Self-timer for the back camera: Though front-facing selfies are all the rage, sometimes you want a bit more quality and control to your images. With iOS 8, it looks as though selfie-takers will get that extra edge with a camera timer. If it’s anything like the similar feature found in third-party apps, it will likely have several options for a delayed shutter, probably up to 10 to 15 seconds. Burst mode for older phones: When the iPhone 5s debuted, it included a quick burst mode, which let users press and hold the shutter button to snap multiple photos in succession. Owners of older iPhones got a somewhat slower version, which only snapped images once every half-second or so. In iOS 8, graphics optimizations will apparently give those users a quicker burst mode. Panorama photos for the iPad: We’ve been able to take panorama photos on our iPhone since iOS 6, but the iPad has been left out of that fun. Fortunately, it looks like iOS 8 will bring the wide-format pictures to Apple’s tablet as well—though you might get some looks as you pan across a vista with your 9.7-inch tablet in hand. Despite all these additions and under-the-hood changes, there’s still a lot you’ll recognize about the Photos and Camera apps in iOS 8. Photos has largely kept the same organizational structure found in iOS 7, with your photo collection divided up into Moments, Collections, and Years as well as Albums. Your Shared Streams also remain intact—iCloud’s service for sending albums of photos to your friends (or collaborating on shared albums) is still as robust as ever. 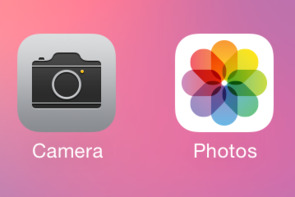 And the Camera app—while hooked into Photos in a new way—retains the same look and feel as first introduced in iOS 7. Come the fall, you’ll just be shooting with a few more fancy tools in your toolbox.